The Olympus E-510 is a compact DSLR camera featuring Live Preview, which allows you to frame your shot using either the optical viewfinder or the 2.5 inch LCD screen. The E-510 boasts a built-in image stabilizer in the camera body which will help to counter-act the effects of camera-shake in conjunction with all Olympus E-System lenses. Based on the Four Thirds Standard, the Olympus E510 replaces the E-500 and features a a new 10 megapixel Live MOS sensor. There's also a new image processing engine which provides sequential shooting at up to 3 frames per second with an eight image RAW buffer in burst mode. Both CompactFlash and xD-Picture Cards can be used with the Olympus E-510, there's the proven Supersonic Wave Filter for dust reduction, plus 18 different shooting modes catering for beginners and more experienced photographers alike. 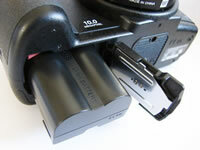 Is the Olympus E510 worth the extra cost when compared to the more diminuitive E-410? 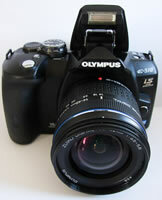 Gavin Stoker reviewed the Olympus E-510 and compared it to the E-410 to find out. Retailing in the UK for a body-only price that's �100 more than its E-410 baby brother is the bulkier Olympus E-510, first announced as a companion DSLR back in March. Although much looks familiar on first glance, the reservations we had on the E-410 about a lack of rounded grip are no longer an issue, as the E-510 boasts enough of a curve to the right hand side of the body to take a firm hold. Those annoying little flapping catches for the strap that got in the way of fingers on the E-410 have also been moved to a better location this time, positioned out of harm's way atop the camera to the left and right. So, while this camera cannot make the E-410's headline grabbing claim for 'smallest DSLR in the world', the E-510 looks and feels like more of a serious proposition. Like the E-410, the Olympus E-510 is solidly constructed, the E-510 having the edge as no one button, dial or catch feels compromised or restricted by budget. At this price however I would have liked some sort of dedicated switch or control to swap between auto and manual focus as found on more 'grown up' DSLRs � instead you have to delve into the onscreen menus to do this via the four way controller at the rear. Still, once you get used to this, swapping can be achieved relatively quickly. Similarly, and again as with the E-410, there's no separate display window atop the camera for quick reference to key settings: you make you choices through a mix of button pressing, command dial twisting and continued reference back to the LCD. That said, you quickly get used to this omission and the mode wheel that's sat in the place it would typically occupy. The top of the E-510 is nevertheless quite busy at first glance. There is, in truth, slightly more room for the controls to breathe than on the E-410, with the shutter release button and exposure compensation button more detachedly sitting on the forward slope of the grip. Just behind this is an identical mode wheel to the E-410, again encircled by the on/off switch. Starting at full auto, and turning the dial anti-clockwise you reach the options of Program mode, Aperture Priority, Shutter Priority, Manual, plus the easy shooting modes that comprise scene mode, plus dedicated night portrait, sports, macro, landscape, and portrait shooting options. The on/off switch itself is in a different position to its little brother. On the E-410 it's positioned right up against the dioptric adjustment wheel for the viewfinder � making use of this visibility aid awkward � whereas here it sits in front of the main command dial. This does mean however that you have to dig your nail into the gap between the dial and the mode wheel to flick the switch forward � and so activate the camera. 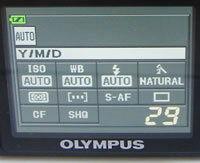 Again, Olympus doesn't appear to have quite found the ideal place for the on/off switch. The Olympus E-510 is equally fast to respond though, with the ability to depress the shutter button and let the AF lock onto target just over a second after powering up, and in advance of the LCD fully waking. Hop over the housing for the built-in pop up flash, with hot shoe for attaching additional illumination if required, and you'll find a pair of buttons identically placed and sharing the same function as on the E-410: namely, in playback mode, copying images between the two memory card formats supported by the E-510 (xD-Picture Card or Compact Flash), or earmarking frames for direct print. Again, switch to shooting mode and this button also becomes a means of calling up the self-timer options on screen (two or 12 seconds countdown), single or sequential frame capture (up to 12 JPEGS at 3 frames-per-second, five more in total than delivered by the E-410, or 7 RAW frames), plus there's the option for those who have purchased an additional remote control to capture a shot immediately or following a pause of two seconds. As on the E-410, you can veritably race through these options using the nicely firm command dial. The second of the two buttons at the top, marked with the familiar lightning bolt icon, activates the pop-up flash itself. Press this a second time and the flash options appear on the rear LCD, which are more plentiful and varied than commonly found on entry level SLRs. For example you get two slow sync modes, and not only auto red eye reduction but slow sync red eye reduction. 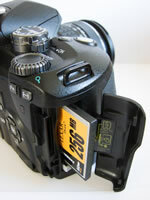 In manual mode you can also control the output of the flash - from full power down to �, 1/16 or 1/64. Again, these options are the same as found on the E-410, and equally as impressive. Moving to the back of the Olympus E-510, and you begin to find some more differences however. Just below the command dial are two buttons � the left 'Fn' as you'd expect is the Function button, to the right of which is an AF frame button, for adjusting the area of auto focus from full auto to biasing either the left of the frame, the right of frame or dead centre. Interestingly, holding down the function button while you take a shot allows you to preview the image on screen without automatically committing it to card � allowing the likes of depth of field to be checked � while you can also assign custom settings to the 'Fn' button � and simply keep it pressed as you take a shot to utilize your personal presets. To the left of these, and in exactly the same position as found on the E-410 is a button for locking auto exposure or focus, adjacent to which is the same rubber eyepiece cover and dioptric adjustment wheel. Below this, we find another difference � and a means of activating that aforementioned image stabilisation function via a dedicated 'IS' button. Here you get a choice of 'off', or IS mode 1 or 2 � options that are again tabbed through using the command dial. Mode 1 turns the image stabilizer on, while mode 2 provides you with an image that is stabilized vertically but not horizontally, so you can take sharp action shots while panning but still leave the background artistically blurred. Immediately below this is a control for switching on/off the E-series' much discussed Live View function, whereby � for those who haven't read our E-410 review � images can be framed and focus checked utilizing the DSLR's 2.5-inch LCD, just as you would use the screen on a common or garden digital compact. Good to fall back on for those occasions when putting your eye flush to the eyepiece proves awkward. Like its smaller sibling, the E-510 doesn't have a separate display window to the main LCD for quickly checking your settings � as usually found atop the camera. Instead the back screen displays essential shooting information on start up, and bursts immediately into life when you press any of the dedicated controls and buttons. Just about all operation revolves around use of the screen therefore � and happily visibility is more than adequate outdoors as well is inside. Immediately below the Live View button sits a familiar four-way control panel, again with a central 'OK' button for implementing any changes to your selection. Whereas the four directional buttons that surround it are unmarked on the E-410 � chiefly because they're used for tabbing through menus or images � on the E-510 you get the chance to change focus modes on the fly via the right-hand arrow marked 'AF', adjust the white balance via the upper one marked 'WB', swap metering mode via the left hand arrow, and finally ISO via the arrow pointing down. This is undoubtedly useful and speeds up operation over and above that offered by the E-410, suggesting this as a pro-sumer rather than entry-level device. Immediately left of this you have the dominating presence of the LCD screen itself, to the left of which is the same vertically stacked four-button range found on the E-410. So the top button is one for playing back images, the second one down is for image deletion, the third (the menu button) for summoning up shooting and playback options, while the last is the 'info' control � that additionally calls up the likes of a histogram on the LCD so you can check exposure levels in the field. Whether in shooting or playback mode, a press of the menu button calls up five folders, unsurprisingly boasting the same options found on the E-410, plus a few more, such as the ability to largely lock down and on occasion limit functionality to suit. Indeed the degree and comprehensiveness of manual control is higher than normally found on a DSLR in this price bracket. Overall the Olympus E-510 feels rugged and built to last, with none of the slightly plastic-y details normally found on a budget DSLR. It's also fast to respond, offers a high level of functionality, and commits images to memory in a thrice. But are those self-same images any better than those delivered by the E-410? Read on and find out. PhotographyBLOG is a member of the DIWA organisation. Our test results for the Olympus E-510 have been submitted to DIWA for comparison with test results for different samples of the same camera model supplied by other DIWA member sites.